There are indications that the National Judicial Commission (NJC) may have recommended the retirement of suspended Chief Justice of Nigeria (CJN), Justice Walter Onnoghen and the retention of Justice Ibrahim Tanko Muhammed as substantive CJN. This is coming at a time the leadership of the All Progressives Congress (APC) has allegedly renewed fresh pressure on the judiciary and the Independent National Electoral Commission (INEC)to find political solution to the disqualification of the party from participating in elections in Rivers and Zamfara states. Daily Sun gathered that the retirement of Onnoghen and retention of Muhammed as CJN are the NJC’s last-ditch effort to bring to an end the impasse in the judiciary following President Muhammadu Buhari’s hammer on the CJN. 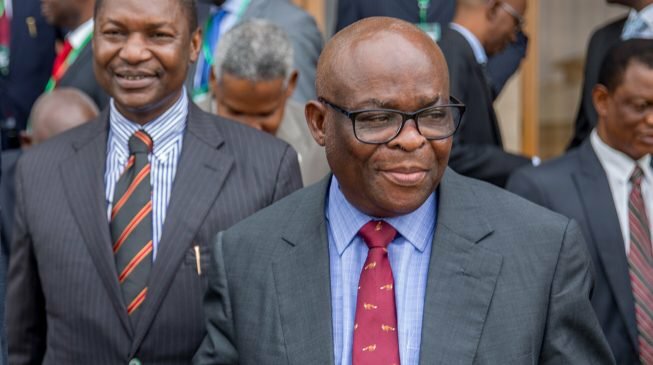 The NJC, which had given Onnoghen and Justice Muhammed seven days ultimatum to answer to petitions against them, will today meet to ratify its recommendation on the CJN suspension saga. A competent source revealed that the NJC resolved that the suspended CJN should retire, in the face of the allegations against him, even though yet unproven in the law courts. On the reason for wanting Justice Muhammad to continue in substantive status as the CJN, the source said the NJC took the decision based on its view that he had not committed any offence or breached any rule. “He presented himself for swearing in based on a court order (CCT). He couldn’t have disobeyed a court order, which the president also relied on,” the source said. The retention of Justice Muhammed will dash the hopes of some powerful forces in the South West, which had anticipated that the next most senior justice of the Supreme Court from the zone will be a beneficiary of the impasse, in the event of the retirement of Onnoghen and Muhammed. Recommendation for Onnoghen’s retirement and retention of Muhammed are contrary to expectations of some lawyers who had canvassed that both justices ought to go to ensure clean slate in the impasse. They cite the case of Abia State Chief Judge, where the NJC ordered the retirement of acting Chief Judge of Abia, Obisike Orji, for accepting the appointment when the State Chief judge, Justice Theresa Uzokwe, was suspended by the state government without its approval. Senior lawyers, like former President, Nigeria Bar Association (NBA), Olisa Agbakoba (SAN) had petitioned the NJC over Muhammed’s appointment as Acting CJN. He had insisted that Tanko was wrong in presenting himself to be sworn in. Also human rights activists, Chief Mike Ozekhome (SAN) and Mr. Femi Falana, faulted the suspension of Onnoghen for being procedurally wrong. Ozekhome argued that the removal of the CJN was a ploy to emasculate the judiciary by the government so as to get political advantage ahead of the general election. The US authorities said the development was a mockery of President Buhari and other Nigerian politicians’ commitment to free elections. A US statement said: “We note widespread Nigerian criticism that this decision is unconstitutional and that it undermines the independence of the judicial branch. In the sane vein, the Commonwealth Lawyers Association also flayed the move claiming that the constitutional procedures and due process stipulated for investigating a judicial officer in Nigeria were not followed. The body contended that the government was entitled to charge members of the judiciary accused of criminal conduct, but that this should be done in a way that was “consistent with the rule of law and constitutional safeguards. “The judiciary, like other members of society, may not be subjected to violations of their fundamental human rights no matter what the charges are against them,” the lawyers said. Meanwhile, there is apprehension over Onnoghen’s appeal against his trial at the Code of Conduct Tribunal (CCT) at the Court of Appeal, which come up Wednesday. Close associates of the suspended CJN are worried about the fate of the case, if the NJC announces the retirement of Onnoghen ahead of the case at the Appeal Court. In its reaction to the Onnoghen case, the CUPP alleged that the Presidency has arm-twisted the judiciary for a deal. CUPP alleged the NJC’s deal with the Presidency is to forcefully retire Onnoghen. The deal, the group further alleged, was struck with the acting Chairman of the Council, Justice Umaru Abdullahi (retd). CUPP said this in a statement issued in Abuja, yesterday, through its first national spokesperson, Ikenga-Imo Ugochinyere. In another development, the APC leadership has reportedly intensified pressure to get a reprieve at the Supreme Court, which will enable the party field candidates in the forthcoming elections in Rivers State. The APC had told its supporters not to panic after last Friday’s Supreme Court’s ruling, saying the determination of the substantive case, which comes up today, may be favourable to it. The apex court, by the ruling dismissed the appeal filed by the Rivers State APC chairman, Flag Ojukaye, challenging the judgments cancelling the conduct of the party’s primaries. A stalwart of the party, who pleaded anonymity revealed that the APC was hoping to get a ruling today that will enable it field candidates in governorship, National Assembly and state Houses of Assembly elections in Rivers State. “We are hoping to get a ruling that will allow us participate in elections in Rivers. Supreme Court is ruling on one of the appeals tomorrow (today),” the party chieftain said. The INEC had foreclosed the possibility of APC fielding candidates in the coming elections. The electoral body said follwing on the expiration of the deadline for APC to submit names if its candidates, the party will not participate in the elections.